The fun has a arrived! After months of hinting and even more months of work the Lilly Dress PDF sewing pattern is now available HERE! This dress was designed not just with personal style preferences but also with functionality in mind. Women are busy, and there wardrobe needs to be able to the cater to that. I wanted a dress that I could throw on in the morning to go to the grocery store and the park with my kids but also be comfortable wearing it out with friends at night for dinner. From this desire the Lilly Dress was born. Its design has elements of added comfort and femininity. Its simple and classic cut won’t go out of style but also allows for you to put your own personal touches on it. A little about the pattern: It is for beginning sewers. Lots of clean lines and technically not difficult. This is a great dress pattern for someone who is new to sewing there own garments. Color photos accompany the written instructions for added assistance. But if you have been sewing for years, its a quick afternoon project. The front bodice has two options, pleats or plain. The dress is fitted through the waist due to the elastic band across the back. At a length of just above the knee this dress will easily become your go to summer choice with flip flops or for winter with tights, boots, and a sweater. 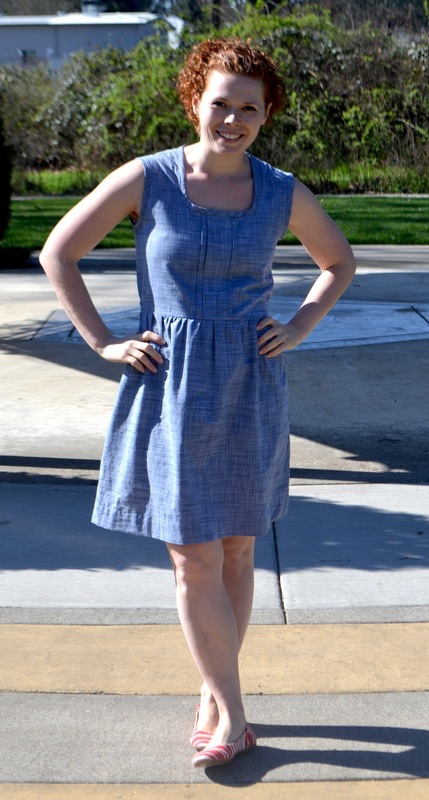 Head on over to my store HERE to purchase your copy of the Lilly Dress PDF Pattern. I hope that you all enjoy creating and wearing this dress as much as I have. And please share your finished products. I would love to see what each of you have created.